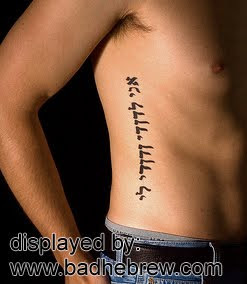 Bad Hebrew Tattoos: This is NOT how King Solomon Wrote it! This is NOT how King Solomon Wrote it! Today's victim got himself the oh-so-common Hebrew tattoo, "I'm my beloved's and my beloved is mine" from Songs of Solomon, which as determined earlier, has no place on a male. However, this guy isn't not here because he got an overused and inappropriate tattoo, he's here because the tattoo also happens to be misspelled. Take a closer look, see those long line-like letters that stick out to the right? Those are Nun-sofit letters and they just shouldn't be there. The Hebrew letter Vav (which appears many times in this verse and carries a sound of V, O or U) was mistakenly replaced with Nun-sofit, a letter which is read as N and can only appear as the last letter in a word. It might be interesting for the Hebrew non-speakers to know, that not only do these two very differently sounding letters look similar, but they are also placed right next to each other on the Hebrew keyboard. Therefore, the mistake this tattoo sports is one that happens all the time in hastily typed Hebrew texts. And this is how you properly write "I'm my beloved's and my beloved is mine" in Hebrew. Can you tell the difference now? Totally has a place on a male. If they were gay. I'm sure that you're a paragon of masculinity. I'm pretty sure David Beckham has this tattoo as well. His wife says he's not gay.